With only THREE games left in the NFL season, teams are making their FINAL pushes to get into the Playoffs. In the NFC, there are currently ELEVEN teams who still have a mathematical chance to get into the Playoffs, but only SIX can get it. Despite losing their starting quarterback, Carson Wentz, for the season with a knee injury, the Eagles still CLINCHED the NFC East, which leaves TEN teams fighting for the FIVE remaining spots in the playoffs. Earlier today, I released the AFC Playoff Scenario, but this blog focuses on the NFC. The Cowboys CANNOT win the division but are just ONE game back in the Wild Card race. They would have to jump FOUR teams, who are all playing better than the Cowboys right now, to get IN. The odds are DEFINITELY NOT in the favor of the Cowboys, but if they keep WINNING, they maybe the odds line up in their FAVOR and they get into the Playoffs. 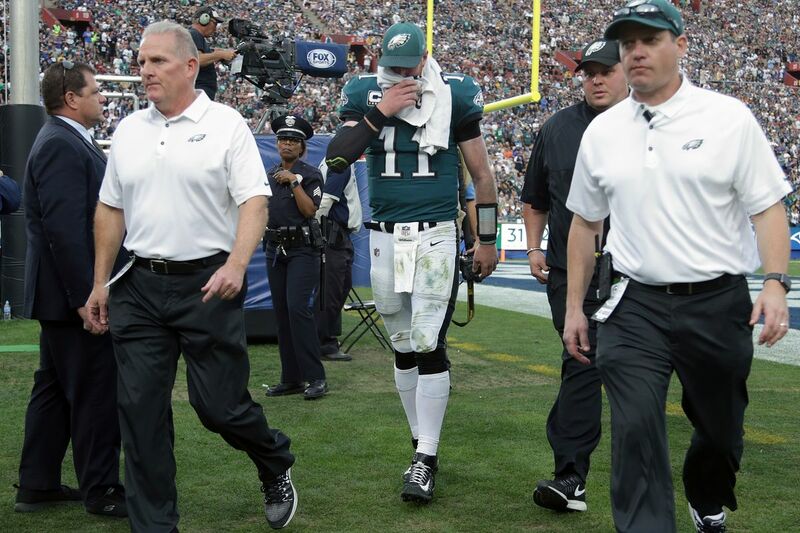 The Eagles are IN the Playoffs but have not clinched their seed yet. They can CLINCH a first round bye with a WIN and a RAMS loss this weekend. Even if they do not CLINCH their seeding this weekend, they will end up getting either the #1 or the #2 seed in the NFC. The real QUESTION surrounding the Eagles is whether or not they will be able to replace Wentz, or their season went down the DRAIN as soon as he got tore his ACL. The Packers have done EXACTLY what they needed to do in the ABSENCE of Aaron Rodgers, who comes back this week and take them to the PROMISED LAND. IF the Packers WIN OUT, which let’s be honest, they probably WILL, then they are IN the Playoffs with a Falcons LOSS, which is also very likely. Despite looking dead at teams this season, the Packers somehow STILL control their own DESTINY. The Lions are currently ahead of the Packers in the standings, but NOBODY and I mean NOBODY thinks that they are going to make a run at the Playoffs. The Lions are one of those teams who if they are on the FRINGE of the Playoffs, they will probably MISS the playoffs. My apologies to all Lions fans, for just berating their franchise. The Vikings can CLINCH the NFC North with a WIN at HOME on Sunday against the Bengals. I would be SHOCKED if they do not win on Sunday and CLINCH their division. The Vikings are NOW focused on getting a first round bye and have the INSIDE track to get there. IF they WIN OUT then they will have a first round bye and will only need to travel ONCE if they end up going to the Super Bowl. All THREE teams in the division are within ONE game of each other, thus all THREE teams are alive for the division. The Saints could have basically CLINCHED the division this weekend, but now the earliest any team in this division can CLINCH the division is Week 16. The Saints currently hold the TIEBREAKER over the Panthers, but do not against the Falcons. Whichever team WINS OUT in this division will win the division and the other TWO teams control their own DESTINY for the Wild Card. The playoff scenario for all THREE teams in the division is KEEP WINNING and they will get IN. The Cardinals are BARELY alive, the next game they LOSE, they are out. They would have to leap frog FIVE teams to get in, so I do not think it is going to happen for the Cardinals this year. The Rams and the Seahawks play in Seattle this weekend and the WINNER of that game will have the INSIDE track of winning the division, while things get MURKY for the LOSER. IF the Rams LOSE, they would fall to one of the Wild Cards, BUT they would still control their own destiny to get IN to the playoffs. IF the Seahawks LOSE, then they would fall ONE game out of the Playoffs and already losing the TIEBREAKER over the Falcons, it will be really hard for the Seahawks to get IN if they lose this weekend. It is a MUST WIN game for both teams this Weekend, but only ONE has Plan B, while the other is going to need A LOT of help. If I had to guess the SIX playoff teams in the NFC are the Eagles, the Vikings, the Rams, the Saints, the Panthers, and the Packers. BUT I am not good at making guesses SO there is NO CHANCE that I guessed it correctly. Check back next week to see how next weekend’s action affects the Playoff picture in BOTH conferences.